Now I realize that the quality of my writing doesn’t stand par with most of the writers already out there, since I rely a little too heavily on cliches and run-on sentences. However, I want to ascertain that becoming a journalist has been a long-standing dream of mine. I have made it into a few riskier countries that are off-the-beaten-path, but to tell the truth, personal safely had been pretty much guaranteed in most of those cases. I was yelled at by the North Korean Military for taking disaster relief photos, nearly fell down far too many mountains when losing my footing, and have been chased around in a Hummer by armed guards in Dubai, but in most of those cases the only real threat was having my photos deleted. This photo was the last of a particular roll I was shooting, just in the vicinity of Pristina, Kosovo. This situation was similar to the last couple mentioned. I had managed to hitch a ride into a post-war reconstruction area with Stig, the head of a Swedish construction-focused NGO. He would be busy with meetings that afternoon, so I took the opportunity to take a walk around the area where the reconstructed housing was scheduled to be built. I ended up wandering out of the “secure area” – there were no signs or other demarcations, how could one have known. I ended up spotting a rather old Greek-Orthodox church of the old order. From what I recall, while much of Kosovo had converted to Islam, the followers of Greek-Orthodoxy moved into modern-day Macedonia.I took this photo as I moved closer to the ruins of the old church. The intricate stonework caught my eye, and strangely enough the KFOR (Kosovar Forces of Resistance) soldiers barely registered in my narrow line-of-sight. Depending on the Political circumstances occuring in a country, you could either only see a civilian police force from time to time, or you might see a constant ocean of soldiers. At the time, certain regions of Kosovo were similar to the latter. Most entry points and secure facilities were under guard by various guises of UN soldiers. 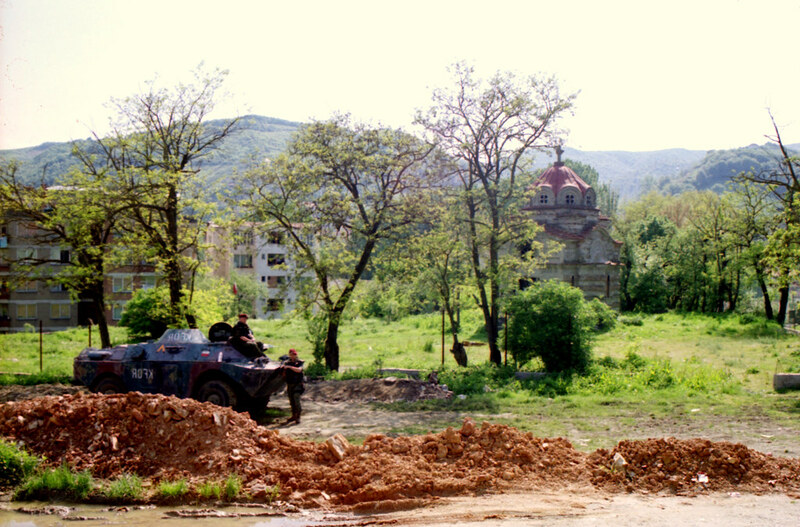 Transport conditions between Kosovo and Macedonia changed radically every few days, when different nation’s Peacekeepers were assigned border duty. I won’t rehash any old stereotypes, but the attitudes of the French, German and US border guards behaved exactly as lax, strict or overconfident as you’d have imagined them to. So, seeing soldiers in the corner of my eyesight never really caused me to have second thoughts, as I assumed they were just another incarnation of the various UN forces. Shooting away, I switched rolls after capturing the up-close shot of the church, that is the next shot in the gallery. When you take photos you aren’t supposed to, but need to take for the sake of journalism, you learn a few techniques for quickly switching out memory cards and rolls of film. I forgot where I stuffed this last roll, but let’s just say they’d have to look pretty carefully to find it. I recommend having a spare memory card on hand with A bunch of REALLY POORLY TAKEN, seriously up-close self-portraits with vague blurry backgrounds like the sky. If you can switch this into the camera quick enough at a security stop, the guards won’t bother looking for the “spy shots” that they are monitoring for. Just remember not to accidentally include these shots in a professional slideshow presentation of your journey. Anyways, one of the guards started calling out to me in what I’d assume was Serbo-Croation. So “Zdrabvo!” (Hello!!) I called out back to him. He continued calling out, but I shook him off as an overly-polite stranger, and continued to creep closer to the old church, trying to take some cool shots of the rusty padlocks and the latticework in the doors. At this point, he was not so much yelling, as he was screaming at me. I likewise responded with the universal peace symbol, the hands-up-no-sudden-movements pose. This, they appreciated, and the closer one of them responded in kind by prodding me with his rifle’s tip, and grabbed the camera from my neck. Likely following the How-deal-with-journalists-playbook, he promptly proceeded to open the filmback of my camera, tore out the film, and tossed the camera, exposed film cartridge still attached, into the dirt. Despite the rifle still pointed in my general direction, my eyes dart down towards the camera, and the only thoughts that pulse through my concrete-thick noggin are 1) the film is a goner, and 2) I didn’t hear the lens crack. *phew*. So I reach down very slowly, and carefully pick up my camera, letting the film trail out onto the ground and abandoning the film and cartridge on the ground. You know when Gollum of Lord of the Rings has the smacked out of his hand? That’s how most photographers will naturally react when you tear a camera out of their hands, or how Russel Crowe reacts when his photo is taken. However… playing it cool, I simply picked up the camera, with one of the filmback-door-hinges snapped off, held it close to my chest, and backed slowly, very slowly, z.e.n. m.e.d.i.t.a.t.i.o.n .s.l.o.w.l.y…. and moved away from the scene. Curiously, it wasn’t until two days later, when I accidentally let some of the details of the event slip in a conversation with the volunteer-supervisor, that I began to have an emotional reaction to the event. The supervisor explained quite clearly how the soldier was under no commitment to let me leave. International Law and War-Criminal-Trials aside, If I were to have disappeared at that junction, there would be no questions directed towards that soldier, and since I hadn’t properly explained my day’s plans to the supervisor, (obviously not, since it would have been rejectied) the volunteer group, and associated NGO’s would have no leads to go on, as to my whereabouts. That could have been the end. It was a minor incident, and the odds of it having actually resulted in my disappearance were probably quite low when calculated statistically. However, feelings are not a direct result of logic, and that incident ended up scaring me away from danger spots rather prematurely. It was the following year when I decided to visit Japan for the first time, because it was so much safer. Safer perhaps, but I think after a decade since visiting Kosovo, I’m about ready for some more excitement again.